Napoleon Hill says that whatever the mind can conceive and believe the mind can achieve. Man has the power to transform his thoughts into physical reality. Man can dream and make his dreams come true. There is one quality which one must possess to win and that is definiteness of purpose. The knowledge of what one wants and a burning desire to possess it. A burning desire to win is essential to success. The starting point of all achievement is desire. Patience, persistence and perspiration make an unbeatable combination of success. The battle is over when one knows what is wanted and has made up his mind to get it, whatever the price may be. Argentina’s Mr. Football, Diego Maradona and his reign as coach of the Argentina National Football team is over. Treason is Everywhere. Apparently people who do not want the best for Argentine football. Maradona has no peers inside the pitch. 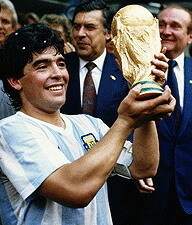 FIFA awarded Diego Maradona the FIFA Player of the Century award in 2000. Diego Maradona on top of the World in 1986. It’s been a roller coaster life of ups and downs for the football great. If it’s any consolation your daughter loves you so much and supports you 100% win or lose. Diego Maradona has an open invitation to coach the USA National team. Spain has made it to their First World Cup Final. The Spain defense controlled the entire game and shut down the high powered Germany blitzkrieg offense. Amazingly, Germany never threatened during the entire game. Congratulations to Espana. They were the better side on that day of the semifinal. The reigning European Champions dismantled a quality Deutschland squad. The Final should be a good one versus a talented Netherlands squad. Hope to see Holland push the ball up the field unlike Germany vs Spain. The game winner was scored in the 73rd minute on a set play off a corner kick, by Carles Puyol. After the game both the German coach and leading scorer Klose admitted that Spain was simply the better team. Offense gets the Glory, Defense Wins the Game. Portugal gave up 1 goal in their entire 4 games in World Cup 2010. That was one goal too many as Spain’s David Villa knocked arch-rival Portugal out of the Cup. Cristiano Ronaldo did not perform any magic. Ronaldo, Messi etc, great individual players are not scoring at all. Great teams are scoring just fine. Offense gets the glory. Defense wins the game. Spain survives and lives to fight another day. They luck out playing Paraguay in the quarterfinals. My Lock is Uruguay over Ghana. While world #1 Brazil battles Holland and Argentina is in a war with Germany who crushed England. Those two quarterfinal matches would normally be worthy of a World Cup Final. And yes, my Brackets are still perfect in this extremely predictable World Cup. 8-0 in round of 16.